As we have discussed in previous posts it is very important to define your borders. And defining your borders means creating some sort of garden bed edging around your garden beds. There are a variety of landscape edging options that you can use for your yard to retain garden beds and to provide a mowing edge for your lawnmower. The options vary from a natural edge to a more defined edge using natural or pre-cast stone. A natural edge is just that, natural. The edge is created by digging down and creating a natural edge with an edger. There is not vinyl, stone or other edging between the lawn and the garden bed. This is your lowest priced option for landscape edging and looks attractive if it is done properly. A natural edge always looks and works best with raised garden beds. In order to keep your garden bed natural edge looking good you will need to spade edge it annually. If this spade edging is not done then the grass will grow back into the garden bed. Vinyl edging is the black plastic looking edging you see in many yards throughout Calgary. Vinyl edging when installed creates a good edge between your lawn and your garden beds. The edge can provide a good mowing retainer to bump up against when you are mowing your lawn. Vinyl edging looks good when installed right and lasts for a very long time. A Common error associated with landscaping edging installation is when it is installed without spikes to keep it in place. Many homeowners and some landscapers will just install the landscape edging without any spikes, over time the landscape edging moves and begins to look very bad. When we replace poorly installed landscape edging we often give it a good tug and have the entire section of edging come out freely, that’s when we know it was not put in right to start with. Next to natural edging, vinyl edging is your least expensive edging option. Stack stone or natural stone edging are a great way to define your garden beds. We would suggest installing mowing pavers against the stone to make your mowing easier. 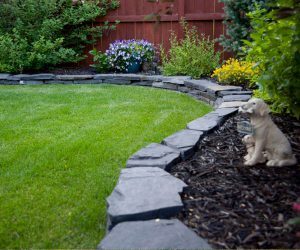 Stone garden bed edges are the most expensive way to add edging to your landscape, but we think they also add the most value to your property. As with any edging, stone edging needs to be installed properly so that it will look good for many years. After excavating the desired area, a base of 3/4 crush rock should be installed and they tamped. After tamping the base repeatedly you then apply a thin layer of sand and then lay the stone on top of it. Mowing pavers are our favourite option for garden bed edging. 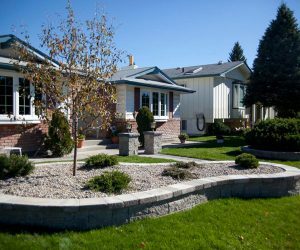 Mowing pavers are in the medium price range and they make mowing a breeze.As we mentioned in landscaping ideas for Calgary gardens mowing pavers are called this for a reason and of course it is because you can mow right over the pavers. With this option you are never going to have to worry about trimming grass up next to your garden bed edging. We install our mowing pavers with a polymer sand between them and that prevents weeds or grass from growing in between the paving stones. Mowing pavers can be matched with your new patio or walkway but they also go well with any natural or precast stone you may have on your walkways or patios. Mowing pavers last for years and years if they are installed correctly with a proper base of compacted gravel. This compacted gravel base helps prevent frost heaves in the winter time.